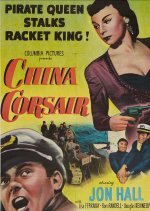 A bargain basement adventure in which various shady characters are after priceless antiques on an island off the coast of China. Our hero is Jon Hall, who specialised in such Hollywood exotica as South of Pago Pago, though here he's without his customary loincloth. Lisa Ferraday is the pretty heroine engaged to rascally Ron Randell, who uses her to get the jewels. Hall and Ferraday were teamed together the following year in Last Train from Bombay; she also cropped up in Rancho Notorious and Death of a Scoundrel before fading from sight. Watch out for an early appearance from Ernest Borgnine, who's made up as a Chinaman - not a pretty sight!